Our facility that we store all of our crates, tents, food, puppypads and t shirts, signs and tents has been flooded. We still have dogma puppies and dogs that need good homes and we are working furiously to make adoptions happen and relieve the burden on our fosters, some have also been flooded or stranded. We will be doing adoptions PER LITTER. Please refer to the FACEBOOK page or the Litter on the website for the litter or available dog’s day. We cannot hold, save or promise dogs. These are emergency circumstances and we ask you to please have patience as we move forward without our adoption supplies. A Special thank you to Acme Bar & Company! We had a great time with the generous and kind Berkeley crowd. Puppies were cuddled and adopted. Raffles were one. We were amazed and so grateful for the generous spirit and kind patrons and new patrons of the Acme Bar & Company! We are dedicated to saving homeless and abandoned dogs from overcrowded animal control facilities throughout the State of California. We host many MOBILE ADOPTIONS and other special events that provide exposure to potential adopters and FUNDRAISE to cover medical bills for abandoned injured animals. Be sure to follow us on facebook and check back with our website. We try and update it regularly with new dogma family members and events! ​Thank you for Joining us at our FUNdraisers! GIVE BACK TUESDAY ARE BACK! 2019 Dates: July 30th & December 17th!! 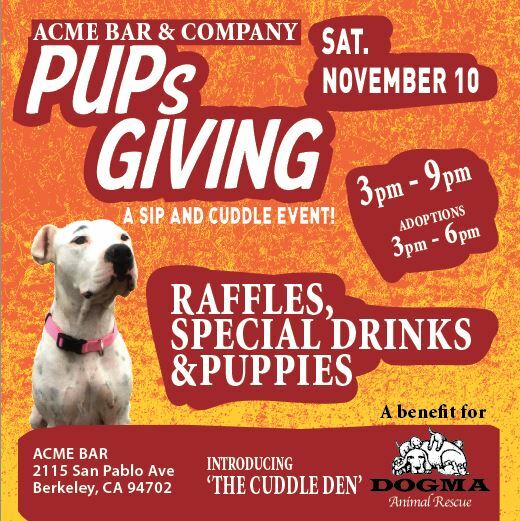 In addition to our scheduled adoption events, Dogma volunteers produce various fundraising events throughout the year. It’s a fun opportunity to socialize with our adopters and supporters, and raise much needed funds for our Community Alteration Program, Dogma’s PALS Program, Senior Dogma Program and Special Needs Medical Program. To learn more about our special programs, please visit our Programs page here. Our 2017 schedule is listed below. We are always adding new dates as opportunities arise. We would love to see you at one of our events.